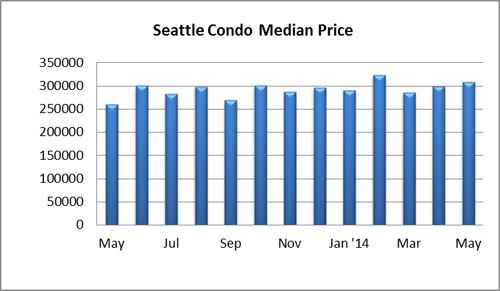 May was an exceptional month for Seattle’s thriving condominium market with condo sales velocity and prices continuing to climb last month. The citywide condo median sales price rose to $307,000 reflecting a one-year and one-month increase of 18.08% and 3.0%, respectively. 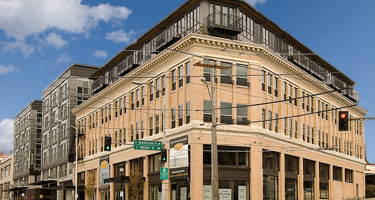 Median sale prices registered double-digit year-over-year increases throughout the city with Capitol Hill and North Seattle surpassing the 20% mark. 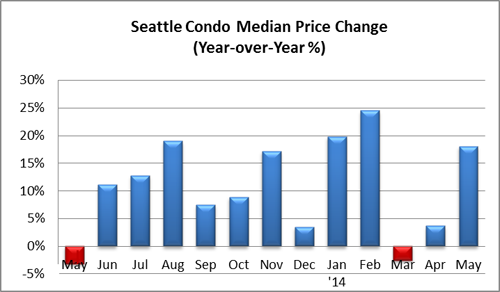 The one exception was the West Seattle area, which saw both a year-over-year and one-month dip. The number of available Seattle condos for sale grew as well to 474 units, a slight 0.9% bump from last year and 15.6% more than the prior month. A portion of that figure were pre-sale units at Insignia & Solo Lofts and back-on-market relaunched sales at Veridian Cove and Carbon 56. Even though the number of units for sale increased, the inventory supply rate remained relatively unchanged at 1.5-months of supply, up slightly from 1.4-months in April, due to robust sales activity. 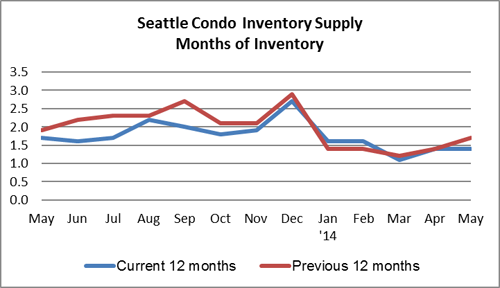 At a rate of less than 3-months of supply, Seattle remains in a strong seller’s market. 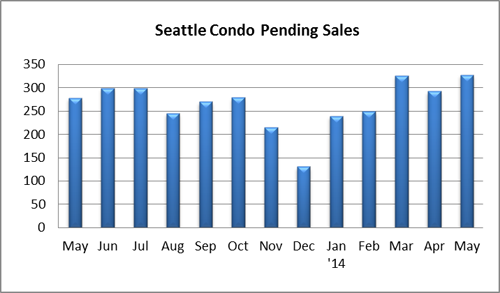 Condo sales (pending transactions) spiked again in May to 327 units, jumping 17.6% over the same period last year and 12% over the prior month. That’s a new 4-year high in unit sales (besting March 2014 by 1 unit). Approximately 8.5% of those pendings were attributable to pre-sales and the back-on-market units. An interesting note…the 16 pre-sale units that went under contract (pending) at Insignia in May contributed to nearly 20% of the condo sales in downtown last month. To date, Insignia has 82 units under contract per the MLS. Those units won’t be closing until the latter half of 2015. 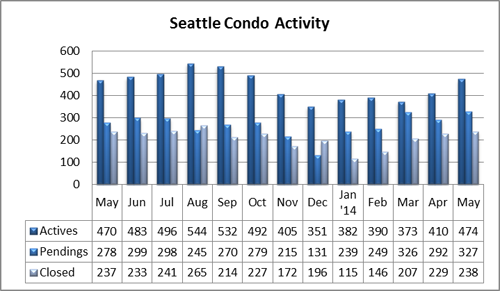 The number of closed condo sales also improved in May, rising to 238 units. That reflected a one-month increase of 3.9% and a year-over-year increase of 0.4%. 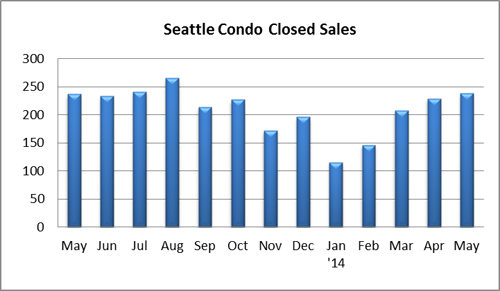 Based on the volume of pendings last month, the number of closed sales should increase in June. Going forward, in the near future, we anticipate more of the same – tight inventory, strong sales volume and rising values.